The Mr. Ping Life Cigar World Tour lands back in Dubai for Dubai Watch Week 2017 after a busy summer season hopping from one continent to the other. As our readers and followers know well, our Cigar World Tour was born from a passion for cigars, shared with fellow smokers and epicureans around the globe. Our next stop is “the city of life”, for a very special edition in partnership with Dubai Watch Week, the region’s first and only watchmaking platform of its kind! “Dubai is dear to my heart; it has been my home for a long time, and after taking our Cigar World Tour to the US West Coast, the Dominican Republic and various cities in Asia earlier this year, I am proud to launch the tour’s Dubai Watch Week Edition during this unique and great horology event by Ahmed Seddiqi & Sons. We’ll be bringing together watchmaking and cigar aficionados to enjoy the finer things in life,” says Jean Ghalo, Founder of Mr. Ping Life. 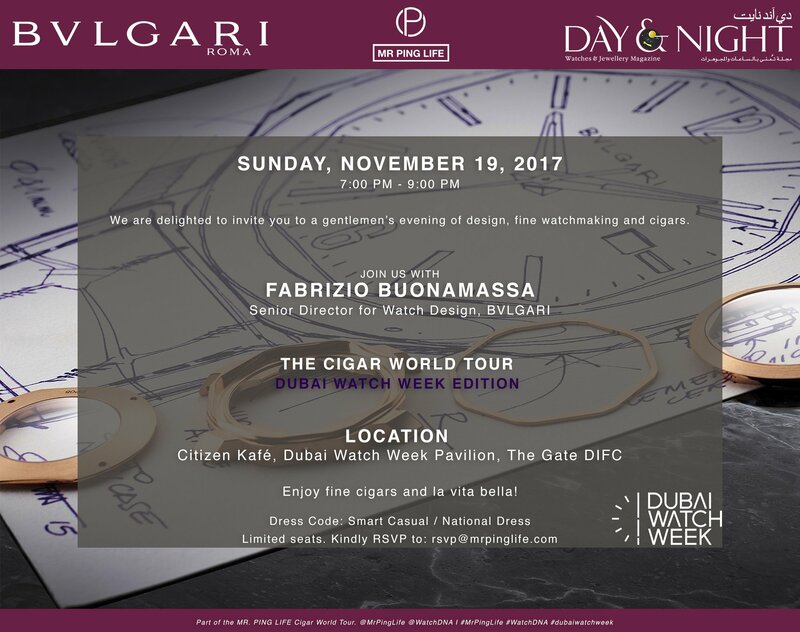 Pairing watch brands Hublot; Moser & Cie.; Bvlgari; and Panerai with various cigar brands, we will be hosting cigar events from November 17 to November 19, along with our friend and the region’s leading watch aficionados magazine Day&Night. As we can’t get enough of good company and good times, and in celebration of Dubai Watch Week and all that’s new in the watchmaking industry, we have extended our activities beyond cigar evenings, and are organizing the regional debut of Zenith Watches’ recently launched DEFY Lab, as well as the global “unmasking” of RJ-Romain Jerome’s latest timepiece that pays tribute to Batman’s heroic personality. 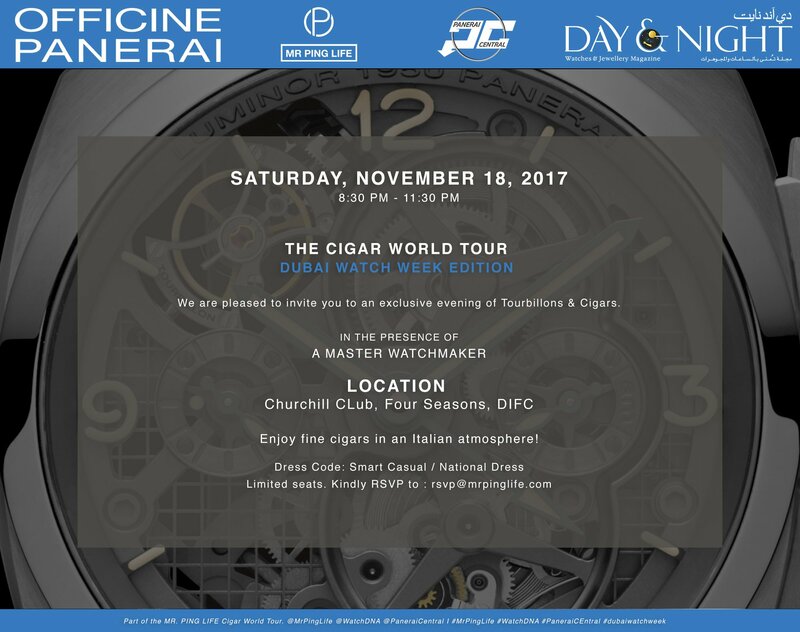 So, whether you’re a watch enthusiast; a cigar smoker or both, stay tuned from November 16 to 20 to live some of these great experiences with us. It’s time for fun times! Previous Post Superheroes Right On Time!